Nymph fishing may be more productive in the long run, but there's nothing like fishing a dry fly to a large trout sipping naturals off the surface of moving water. Focus, timing, control, stealth, anticipation, reaction, all overwhelming any thoughts outside the small sphere that encircles the angler and his quarry. In fact, when you are in that world, you stop thinking and your inner autopilot takes over - you are truly engaged in the moment. Last Sunday I met up with John Collins on the South Branch of the Raritan River to do some late winter fishing. While we were getting ready to go, he was telling me about his newest addition to his "Electric" series of fly patterns - you may remember his Electric Caddis Pupa video he made with Tim Flagler - and showed me some of his creations. The abdomen of these patterns are made of colored wire that is fed into hollow, clear tubing and wrapped on the hook as one, creating the effect of depth and segmentation. Just by changing the wire color, he can adapt the look of the pattern to imitate just about any caddis larva or pupa, or mayfly nymph. Pretty cool stuff. John is also well-known for his sculpin patterns, some of which are very accurately colored imitations of this abundant trout prey, and some of which are brightly colored. Here a link to his Snowflake Sculpin, which I can say from experience works very well for big wintertime trout: JC Snowflake Sculpin. Here's a great video from Tightline Productions with our friend Tim Bartholomew showing how he ties a Hackle Stacker Hendrickson. Its a technique that can be used to tie any mayfly adult pattern that, as Tim says, creates a fly that may be taken for a mayfly dun, cripple or spinner. Its a technique that will take some practice to get the hang of, but once learned, will add another pattern type to your dry fly box. I like them for the smaller mayflies - Blue-winged Olives and Sulphurs. 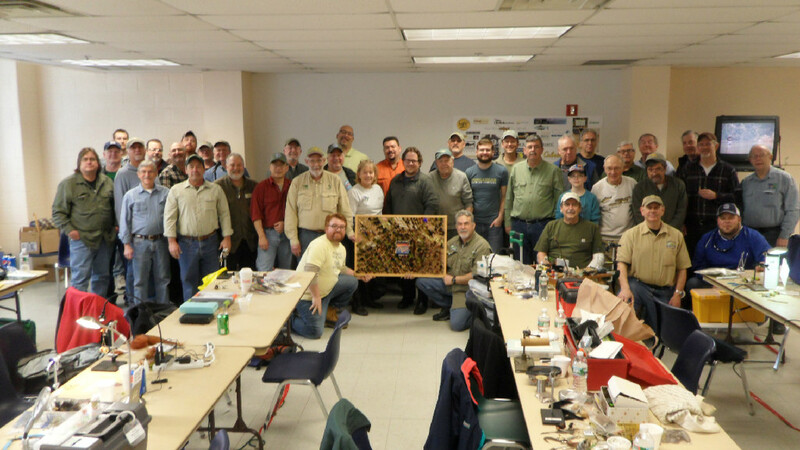 On this coming Sunday, March 20th 2016 at 9:00 AM, The Rahway River Trout Unlimited Chapter will host the Fifth Annual Fly Tying Madness Event at The Pequest Fish Hatchery Natural Resource Education Center. Sponsored by The New Jersey State Council of Trout Unlimited - Ten Chapters from Trout Unlimited from across the state will gather to tie fishing flies to donate to wounded warriors thru organizations such as Project Healing Waters Fly Fishing. They also tie for breast cancer survivors from Casting For Recovery and The Trout Unlimited Veterans Program. This years event will be a bigger & better event than last year with some of New Jersey's finest Fly Tyers in attendance. Everyone is welcome to come and tie regardless of skill level. All tied and donated flies will benefit; Healing Waters, Casting for Recovery, and the Trout Unlimited Veterans Program. Complimentary breakfast and lunch will be served. Here's another competition style nymph tied by Doug Freemann and produced by Tightline Productions. Its a version of the tried and true Prince Nymph, tied on a jig style hook. Doug almost always fishes at least one jig style fly on his tandem nymph rigs, and having spent many days on the water with him, they work very well. In case you are wondering, the white biots are tied on the "bottom" of the fly because Doug says its difficult to tie them on the other side due to the sharp hook point, and he says its not worth the trouble because when the fly is in the water it tumbles with the head down so it doesn't make any difference. Makes sense to me, and the way the fly works, the fish certainly don't seem to mind.